I absolutely love being married. I won the jackpot when Paul chose to love me. Seriously. Still, marriage is a challenge lots of the time and requires intentional work to keep the marriage thriving. If couples ignore problems, hurts, or distance, then the marriage can greatly suffer and both parties can find themselves floundering. 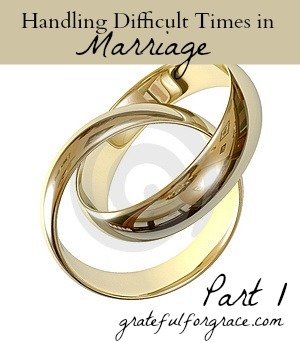 All marriages go through seasons and there will be times of serious challenge. The key is knowing this and working on the marriage, even when it’s not fun. As I said, Paul and I have a fantastic marriage. We love each other deeply and enjoy one another greatly. And it’s still work sometimes. And we have still had a season of pain and distance in our marriage. How did we persevere through our rough season? 1. We committed to our covenant from the start. From the very beginning, Paul and I verbally, emotionally, spiritually, and mentally stated that we were committed to our covenant no matter what. For better. For worse. We talked about that. We didn’t just recite vows at our ceremony. Nope, we discussed what being married meant: til death do us part. 2. The d-word (divorce) has been banned from verbal or mental dialogue. As a part of our commitment to our marriage, we agreed to never use the word divorce in our arguments or in our bad times. It has never been an option for us. This meant that we couldn’t throw it out in the heat of anger and we couldn’t entertain the idea in our heads. I did once, early in our marriage. Early. Paul called me on it. Neither of us has forgotten it. How it hurt Paul. How it betrayed us both. It has never happened again and I am confident it won’t. 3. We didn’t stop dating. Our rough season lasted a year. That’s a really long time. And I don’t mean sorta rough. No, I mean a palatable distance that caused my physical body to truly ache. We had trouble talking. We had trouble being intimate. We had trouble even hanging out. But we didn’t stop dating. True, it wasn’t as often as it could have (or should have) been, but we still went out just the two of us. More than a few times, it was awful. We argued. We sat there miserable. We wondered if it was worth the yuckiness. We did it anyway. Why? Because we had to be with another alone so that our hearts remembered that we are more than parents. We had to be alone without the kids so that the children didn’t become crutches that we depended on forever. 4. We prayed. We didn’t do this together much, that’s how bad things were, but we prayed our hearts out that God would draw us back to one another emotionally. Fervent prayer. Tear soaked prayer. 5. We sought counsel from friends we trust. I just recently found out that many people think this is wrong (there will be a whole other post on this issue), but I strongly disagree. We need to seek godly counsel and we have to be a bit vulnerable when we are in dire straights. Marriages that are so private they share nothing with anyone else, often end. No help was given because no help sign was held up for others to bless, encourage, equip, or pray for the hurting. Honestly, I think I am the only one who did this. I was freaking out about our situation and scared. I talked to older, wiser, more experienced friends. More on this tomorrow. 6. We fought the urge to ignore one another. When a marriage is truly hurting, the natural response is to withdraw. This might be natural, but it isn’t godly or helpful. We had to make ourselves talk to one another. True story. If you haven’t been in this situation, it might seem ridiculous, but if you have, then you know what I mean. When a heart is hurting, it doesn’t want to talk to the one who is doing the hurting. That isn’t a good thing in a marriage, though. It can feel wrong, though, to talk to someone you want to run from quickly. Still, we knew it would further damage our marriage if we withdrew. So, we talked. Sometimes, I truly had to talk to myself about persevering in this despite my flesh’s urge to walk away. 7. We evaluated what was happening and why. While talking was seriously difficult in private, we had to do so. It was painful and awkward and terrible. We had to each think and talk about what was happening and why it was happening. For us, it was the life changing move. Everything changed. Everything. New church. New friends. New (very very very different) state. New kind of job. New daily routine. New kind of work environment. New climate. New cost of living. It hit us hard and we were quite unprepared for how difficult it was going to be to leave the place, people, and family we loved. By talking, thinking, and praying, we knew what had knocked us off course. Couples must take the time to really, honestly, and humbly think this through. 8. We believed it would get better. Ok, no worries. I am not one of those people that thinks just believing life will get better makes it so. As you can see by the other actions we took, we know that we must be active in helping our marriage. Still, I think it’s important that we remember life has seasons and so do marriages. I had hope that our rough time would end if we persevered in working on our marriage, our life, and our relationship. Hope is always important in a marriage and once it dies, so does the marriage. After a year of a season of marriage I was completely unfamiliar with for Paul and me, we broke through the fog. The heavy, ugly, confusing, painful, and stifling fog. Nothing major happened. Nothing super spiritual or emotional changed. Nothing made us turn the corner. We just came out of it. And I wept with joy. God was and is faithful. He never abandoned us during our difficult time. He blessed our faith, our perseverance, and our effort in preserving our marriage. And I’m so so grateful. Come back tomorrow to hear the actions I believe we should have taken in addition to the ones above. How many of these tasks resonate with you? Have you walked this path?